A thermostat regulates the heating and cooling system by maintaining the temperature that you prefer. It controls the release of hot and cool air by switching your HVAC devices on and off as needed. 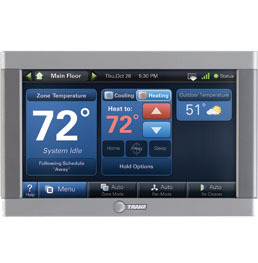 Newer and more advanced models of thermostats offer increased control for optimal energy conservation. You can choose a temperature for your whole home or individualized rooms depending on the options of your device. Quality thermostats help contribute to increased comfort, energy optimization, and money savings. If you need to upgrade your thermostat or have any questions about how a thermostat can improve your HVAC system, contact B&L Ott today to request service. Our experienced technicians will be happy to meet with you to discuss your options and preferences.